Granite is one of the most popular stone types for a reason. Granite is one of the hardest, densest natural stone varieties. Regardless of the conditions your granite fountain endures over many years, it is sure to stand the test of time. Granite is an ideal material for your fountain if you live in a colder, northern climate or an area with a freeze/thaw cycle. This fountain is hand-carved from Bianco Catalina granite and is self-contained, so an additional basin is not needed. The overall design of the fountain is perfect for a garden or patio. It features acanthus leaf and petal-like details on the basins and finial. Take a closer look at this fountain. 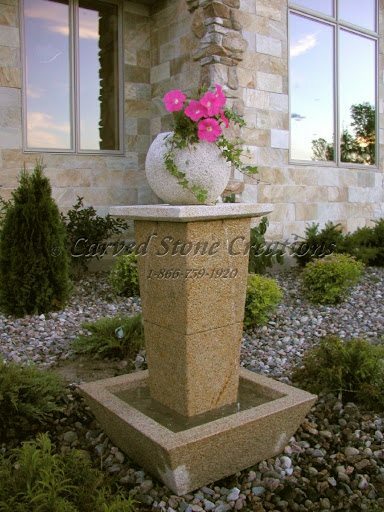 This elegant contemporary style fountain features clean lines and simple shapes that are sure to complement any garden. The fountain is hand-carved from Giallo Fantasia granite stone. The water gracefully trickles from the top of the pedestal down into the basin. View more details of this fountain. Add the soothing sound of flowing water to your garden with a bubbling granite fountain. This fountain is carved from Charcoal Grey granite and features polished and rock-face finishes. The water flows down the sides of the fountain, accents the different finishes and creates a beautiful display. Learn more about this fountain.